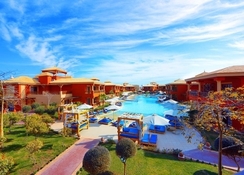 Located in the lovely tourist town of Hurghada, the Alf Leila Wa Leila offers 567 bright and airy rooms. The hotel’s classic décor along with its many amenities offer a comfortable and perfect stay. 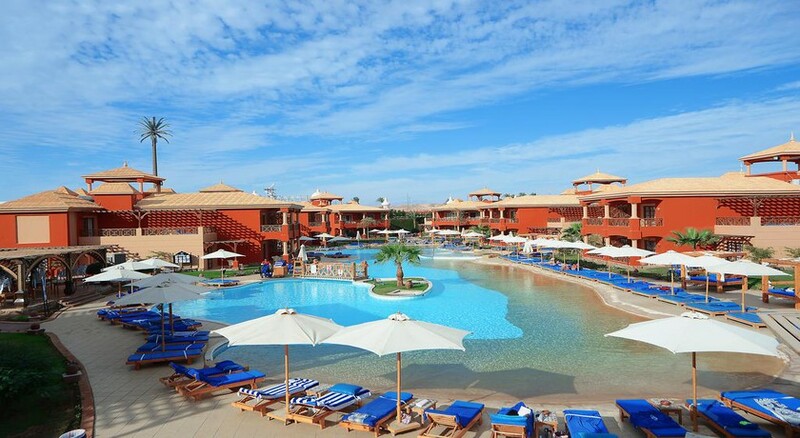 Located less than a kilometre from the beach, the hotel features spectacular views of the sun, sand and sea. 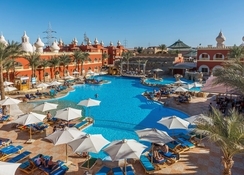 Other services that are offered here at the hotel are a 24-hour reception, concierge, internet connection. There’s also a babysitting service and a plethora of activities for children as well as adults. The rooms have a furnished terrace or balcony, a complete bathroom with shower and hairdryer, and are equipped with air conditioning. You can watch a movie on the flat screen TV and connect to the internet, as well as enjoy a drink from the minibar. The hotel’s five restaurants and 10 bars – all featuring different themes, offer perfect spaces to have cocktails, coffee or a varied offer of culinary specialties, such as traditional, Italian, international or Asian cuisine. A spectacular outdoor pool and spa invite guests to relax, and there are also sports facilities and a children's juice room, and another with table tennis and billiards. The common areas are completed with spectacular terraces, shops, spaces for the celebration of private events and a business centre and an outstanding theatre with room for 2,500 guests. 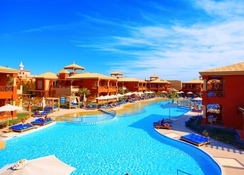 In the tourist city of Hurghada, around 14km the airport and 18km from the city centre, is the Alf Leila Wa Leila Hotel. It is a fantastic four-star complex located just 900m from the Jungle Aqua water park and about 900 meters from the beach, where you can practice scuba diving or snorkelling. Some of the activities to do during your stay here in the hotel include walking through the picturesque old town, visiting the Ancient History Museum of Ancient Egypt or the Papyrus Museum. Other places to visit as a family are the Aquarium or the Dolphin World and you can take an excursion through the Safaga Mountains. A classic and elegant design with sophisticated wooden furniture and features for its brightness, are some of the attractions of the hotel rooms. They are distributed in two options, standard or family and all rooms are communicated. Most rooms have a terrace or balcony equipped with outdoor furniture and views. You can watch the flat screen TV or connect via Wi-Fi to the internet to enjoy a leisure time, have air conditioning, a telephone line direct and a safe. There are drinks in the minibar and in the bathroom you can enjoy complimentary toiletries and a shower and hairdryer. Alf Leila Wa Leila features amazing restaurants and bars, where you can taste Italian, international, traditional and Asian cuisines. There are dietary menus on request, snacks or cocktails and some days, live music. An outdoor pool surrounded by sun loungers and a spa with sauna or massage rooms allow guests to enjoy their stay. The 24-hour reception helps you with information regarding the local tourist attractions. The hotel also organises a host of leisure and sports activities for you to enjoy. Guests can travel to the beach via the shuttle offered by the establishment. The hotel complex has a games room for adults and children, and there’s also a state of the art gym, tennis courts and activities directed at the pool. The theatre has a capacity for 2,500 people.